Temperament: Boston Terriers are gently, lively and friendly dogs. They have an excellent disposition. They can occasionally be over excited or rambunctious. Family Dog: Boston Terriers make great family pets they are good with children, elderly people and strangers. They are very affectionate and enjoy being treated like part of the family. Boston Terriers typically get along great with other household pets. Shedding: Boston Terriers are average shedders. Grooming: Boston Terriers are very easy to groom because of their smooth short coat. They should be brushed with a firm bristle brush and bathed only when necessary. They should have their face and eyes carefully cleaned daily. The nails should be kept short. Training: Boston Terriers enjoy learning and therefore are fairly easy to train but may be difficult to housebreak. Barking: Boston Terriers make good watchdogs and bark only when necessary. Weather: Boston Terriers are very sensitive to extreme weather conditions. Exercise: Boston Terriers should have a long daily walk or ample play-time. This breed does not need a lot of exercise to stay in shape. Living Conditions: Boston Terriers make great apartment dogs. They are not very active inside and will do fine without a yard. Appearance: Boston Terriers are very intelligent and lively dogs. They have a smooth coat, small head, short tail and compact build. Their coat is seal, brindle or black with an even marking of white. Their expression is one that portrays a high degree of intelligence. Size: The Boston Terrier has three different weight classifications, less than 15 pounds, 15 to 20 pounds and 20 to 25 pounds. They should be between 15 to 17 inches tall. Companionship: Boston Terriers make great companion dogs. They are extremely loyal and intelligent. Head: The head of the Boston Terrier has a square shape. The head is flat on top and wrinkle-free with flat cheeks flat and well defined stop. The Boston Terrier's expression should be alert, kind and intelligent. Nose: The Boston Terrier's nose is wide and black in color. It should have a distinct line separating the nostrils. Eyes: The Boston Terrier's eyes are large, round in shape, dark in dolor and set far apart in the head. Ears: The Boston Terrier's ears are small and carried erect. They may be cropped. Muzzle: The muzzle of the Boston Terrier is short and square in shape, proportionate to the size of the head and parallel to the top of the skull. The muzzle should be wrinkle-free and slightly shorter that it is wide. Its length should never exceed one-third of the length of the skull. Teeth/Bite: The jaw of the Boston Terrier is wide and square in shape. The teeth are short with an even or undershot bite. Neck: The Boston Terriers neck should be long enough to balance the body and slightly arched. The head should be carried gracefully on the neck. Body: The Boston Terrier is short with strong limbs. The body gives an indication of strength and determination with a graceful appearance. The Boston Terrier has a square build with the length of the legs and the length of the body being approximately equal. The topline should be level curving only slightly at the rump. The chest should be deep and wide with well sprung ribs. Forequarters: The shoulders of the Boston Terrier should be well laid back and sloping giving them their elegant movement. The elbows should be straight. The legs should be spaced widely and in line with the shoulder blades. Hindquarters: The Boston Terrier's rear legs are muscular and bent at the stifles. The hocks are short and straight with a well defined joint. Gait: The Boston Terrier's gait should be straight and sure footed. Both sets of legs should move straight, in line and in rhythm with each other. Every step should give the appearance of grace and power. Feet: The Boston Terrier's feet should be compact and round in shape. They should turn neither in nor out. The toes are well arched with short nails. The dewclaws may be removed. Tail: The tail is short and set on low on the body. It tapers slightly down its length. It should be straight or screw and carried low, below the horizontal. Color: The coat of the Boston Terrier can be seal, brindle or black with white markings. A seal coat is defined as one that appears black but has a red cast when in the sun or bright light. The Boston Terrier should have a white muzzle band, white between the eyes and a white forechest. It is also common to have a white over the head, a white collar and white the legs. Coat: The Boston Terrier has a short, smooth, shiny coat that is fine in texture. Life Expectancy: Boston Terriers typically live to be 15 years of age or more. Characteristics: Boston Terriers are very sensitive to the tone a person's voice. They tend to drool and snore. Health: Boston Terriers may have trouble breathing especially when stressed or in extreme weather conditions because of their short nose and compact face. They typically have difficulties giving birth because the narrow pelvis and large heads of the pups. They often need the help of a vet to give birth by cesarean section. Boston Terriers also have a hereditary tendency toward heart and skin tumors. Eye Health: Boston Terriers commonly have eye injuries due to their prominent eyes. 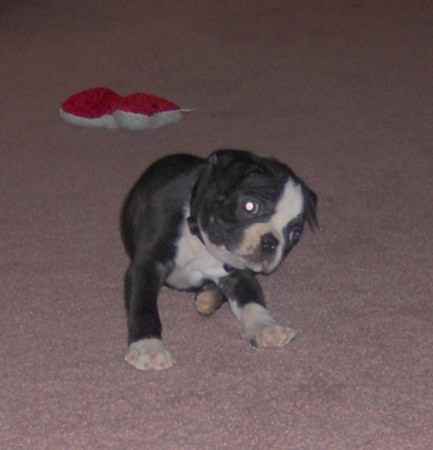 Litter Size: Boston Terriers usually have 3 to 4 puppies in a litter and typically by caesarean section. History: The Boston Terrier was originally bred from pit-fighting bull and terrier dogs. The first Boston Terriers weighed up to 44 pounds. Their current weight classifications were originally used as divisions in their fighting days lightweight, middle and heavyweight. Boston Terriers are one of the few breeds that were developed in the United States. The first Boston Terriers were bred as a cross between the English White Terrier and the English Bulldog. Over time the Boston Terrier was gradually bred down in size. The offspring of the English Bulldog and the English White Terrier which is now extinct were then bred with the French Bulldogs producing today's Boston Terrier. By 1889, these dogs became very popular in Boston and the American Bull Terrier Club was founded. This name was not well received by the Bull Terrier Fanciers and thus was renamed to Boston Terrier after its birthplace. They were first recognized by the AKC in 1893.